The message is quite clear. It needs no translation. It really needs no explanation. 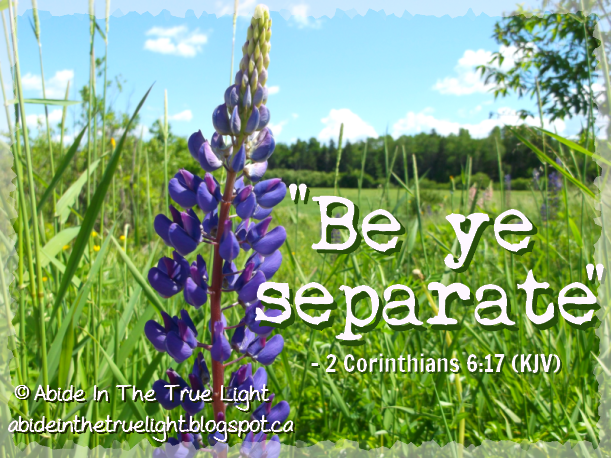 "Be Ye Separate". Frankly, this is a passage of scripture that speaks for itself. However, there are Christians who do not understand the importance of this scripture nor do they feel that this scripture needs to be taken literally or seriously, for that matter. It does not stand up to their "modern-day Christianity". They take the Holy scriptures and sand down the edges to soften the meaning, reshape it, water it down, and are left with a scripture that has been melted and molded to mean what they want it to mean. They are only deceiving themselves. They cannot deceive our all-knowing God. There are so-called Christians who create their own definition for what a "separate" life means and bend it until it fits perfectly in line with their comfortable lifestyle. They can try to convince themselves that they are walking in the right direction, but as long as they are striving to be popular and to fit in as "normal" in this world, their hearts are not right with God. Those who choose to dip their toes in the mire and play with fire, are walking a dangerous path. Yes, we do live in the world, but we do not need to be part of the world. Our hearts should desire the things of God more than the things of the earth. When you follow God, you must put away worldliness and be willing to walk the road less traveled, like Noah and Lot did. Jesus Himself was humble and lowly, He was not popular or accepted in this world. If we are to follow Him, we need to be more like Him. If our King was rejected, we are to be rejected. Otherwise, we are no different than the rest of the world. We need to be different. We need to separate ourselves from the world and the things of the world. When we are born again, it means that we are starting anew. We are born into a fresh and different way of life, a whole new direction. One that is changed. A sincere Christian is happy to put away the things of the world and walk with God. We need to let our light shine brightly so that all who see us may know that we are followers of the King. As Christians, we are to be good examples, witnesses of God's light and love. We are to walk separately from the rest of the world on a path of faith and truth and goodness. Remember that there may be new and/or struggling believers out there who are watching you closely, learning by your choices, and being guided by your way of life. If how you live does not fall in line with what they read in the bible, they could become discouraged and turned away from religion....because of you. How you choose to live your life does indeed affect others! Only God knows who is affected by your walk. Through the years, we have sadly seen many Christians lose their way due to a gradual lack of reverence for God's Holy Word. They have been carried away by their own scholarly wisdom and have lost touch with the straightforward beauty and simplicity of the scriptures. Many Christians, including pastors and authors, have tried to take the seriousness out of God's Word by watering it down and by also adding a touch of "humor" to lighten it up and to make it seem more appealing and acceptable in today's world. Christian jokes have no place in a real Christian church, in a real Christian home, or in a real Christian heart! This thing called "Christian humor" is something that sours, curdles, and sickens the sincere Christians' stomach. There is no such thing as a good joke where Christianity is concerned. Very few churches today, only a remnant, are actually adhering to every word found in the King James Version of the Holy Bible. Very few church leaders are preaching the consequences of sin. Instead, they choose to preach feel-good messages about "prosperity" and "loving yourself" to cater to their congregations. The King James Version of the Holy Bible has been deemed as "too old fashioned" and has been replaced with newer, more contemporary versions (perversions!) of the bible, ones that take the Holy Scriptures out of context and change their beautiful meaning altogether! Cold, hard "Christian rock" music and sensual, impersonal "Christian Pop" music have now replaced the sweet and simple hymns of faith that, in times gone by, had drawn so many of us Christians closer to our Heavenly Father. These fallen, corrupt churches embrace the things of the world, the ways of the world, the styles of the world. Faded jeans, cleavage-exposing tops, and casual attire have now replaced the long, prim and proper dresses and neatly-pressed suits of yesteryear. Church-goers are no longer required to enter the House of God with reverence, honor, praise, clean hearts, morality, and modesty! The church has become the social club, the concert hall, and the home of laughter and parties and wine! The Holy Spirit is no longer welcome there. The door has been shut on biblical truth and has been locked with a dead-bolt. These apostate churches are walking hand-in-hand with the world....and it is of their own accord! Compromising is not only found within so many churches today, but also within so many individual Christian homes as well. These so-called "Christians" are playing the deadly game of "I can live like the world and still go to Heaven"! They want the best of both worlds and justify their worldly lives by saying, "God knows that I am human and that I need to be happy and live a successful life while here on earth". They shamelessly watch all of the modern television programs and go to all of the latest movies, despite the subtle and not-so-subtle sexual references, scenes, messages, and distasteful language. Keep in mind that most of the movies that fall into the "family" category actually contain very questionable material as well and are not suitable for a Christian audience! Use your conscience. Use discretion. Be cautious. Keep it clean. Keep it family-oriented. There are plenty of old movies and old television programs that are fit for Christian families to watch. Why settle for anything less than clean, moral, and decent? So many Christian parents allow violent video games and rebellious music into their homes, not giving a care to the filth that is being fed into the innocent minds of their children and teens! So many Christian hearts have pushed out the Holy Spirit to make room for immoral indulgences, sexual lusts, selfishness, and greed. They shamelessly fill their lives with wine, riches, and secular song! They accept all forms of adultery, twisting God's Word to fit their loose lifestyles. They have become "lovers of their own selves" and "lovers of pleasures more than lovers of God". Something which never fails to shock and sadden us is the immodest clothing which is worn so shamelessly among those who call themselves "Christians"! Bikinis, mini skirts, low-rise jeans, plunging necklines....you name it! They have no shame before The Almighty God, whose Word distinctly includes an important passage about women dressing modestly and behaving soberly. You can continue to walk with the world and call yourself a "Christian" and you can keep trying to convince yourself that, "if so many other Christians are doing it, it must be right".....but that will not excuse your daily moral choices when the day comes that you stand before The Great Judge, your Creator, and have to give account of your life. Do not follow man. Follow only God. Do not be guided by the decisions of others but rather let God's Word, The Truth, guide you. Ask yourself these three following questions and give an honest answer. Read God's Word below each question and apply it to your life. 1) Do you suffer rejection because of the stands that you take and because you are "not of this world"? Or are you accepted by the world? 2) Do you love God with your whole heart? Do you love Him more than you love the things of this world? 3) Does your heart long for success and popularity in this world? Do you love money, luxury vacations, costly clothing, large homes, wine, and lavish parties? Or do you flee from these things and cling close to the things of God? 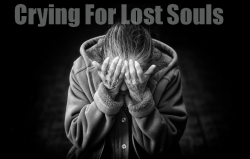 If you are reading this and something deep within your heart is telling you that you are not walking "the separate life", it is time that you devote yourself to earnest prayer and scripture reading. Please do not wait another moment. Ask God to open your mind, your heart, your eyes to His Truth. Ask for Him to help you let go of the things of this world and to grasp on to the things that matter most. Ask for Him to help bring back the purifying "salt" and "savour" in your life. Friend, we care about you. Keep in mind that it is not our intention to "judge" other Christians but to use God's Holy Scriptures as a means of "correction" in a world where wrong has become right and right has become wrong. Be careful of the company that you keep. If your church is walking with the world, it is time to walk away from that church. In this day and age, a good church is hard to find. Ask for God's guidance in finding a church that preaches the true gospel, a biblically sound doctrine. Ask God for wisdom and for discernment in sifting out the good from the bad, the true believers from the false prophets. If you are unable to find a church to attend in your area, do not be discouraged. Where there is no church, there is still a Living God who is Faithful and True. Try forming a small bible study group with one or two other believers or friends. "For where two or three are gathered togeher in my name, there am I in the midst of them." (Matthew 18:20 KJV) If you are all alone, with no fellow believers to join you, try tuning in to a television ministry or internet-based ministry/community that can provide encouragement. Also, be sure to set aside time for deep earnest prayer and worship time....a time for you and your God. It is not a matter of "where" you serve God, but "how" you serve God. The bible says that God "dwelleth not in temples made with hands" (Acts 17:24 & Acts 7:48 KJV). God's Spirit dwells within your heart. You are the temple of the Most High God. "Know ye not that ye are the temple of God, and that the Spirit of God dwelleth in you?" (1 Corinthians 3:16 KJV). Whether you serve Him in a church made with hands or in the privacy of your own home, God is there with you...right where you are. He is omnipresent. Please see: The Church Walking With The World - a poem by Matilda C. Edwards. Please see: Ready To Meet Him? Please see: Salvation - How To Be Saved to re-invite God into your heart and re-dedicate your life to Him. Great article! We really enjoyed reading it and were encouraged in our faith! We are missionaries in Honduras, and we are looking for good, sound doctrinal teaching and Bible studies. Thanks for the article! thank you so much, i needed this. of course as a human i want to be accepted by my peers, ive even told myself that i needed to 'prove' my faith by just going along with the crowd, and saying grace has it covered, it does not matter. but my spirit is sad ,grieved, i want to get back to Gods Holy Word, I love Jesus and need to make Him first and foremost in my life. thank you please pray for me. Thank you for taking the time to write to us today. Your words are from the heart and your love for Jesus is very evident. He knows your heart and He knows your needs like nobody else ever could. He cares and He knows that you want to make Him first in your life. He loves knowing that your heart is hungering for Him and that you desire to live a life that is obedient to Him. He can fill you with all that you need. He can restore, refresh and renew you. Believe it. "Blessed are they which do hunger and thirst after righteousness: for they shall be filled." - Matthew 5:6 (King James Version). Reading His Holy Word on a daily basis (setting aside a special time during the day or night to read a few chapters and to pray) gives amazing strength and is the key to a closer relationship with Him. He wants our love and our time. He wants us to talk to Him like He is our Father, our Best Friend, our King. He wants us to love Him enough to obey Him too. "If ye love me, keep my commandments." - John 14:15 (King James Version). You are wise because you realize that we, as Christians, cannot assume "grace has it covered" because God's Grace is not a license to sin or act like the world. God has put this Truth in your heart. So many modern-day Christians do not realize this. Cynthia, we will most certainly be praying for you today and we will continue to keep you in our prayers in the days and weeks and months to come.